Shortcodes are a convenient functionality made available to WordPress users. With Shortcodes, you get to do a variety of activities, with little to no effort. From helping you to add custom buttons, to content boxes, or alert notes, these shortcodes can help you to embed files or create objects which would otherwise require a lot of complicated coding. And so, to ease your life, we have put together a list of some of the best Shortcode plugins for WordPress. 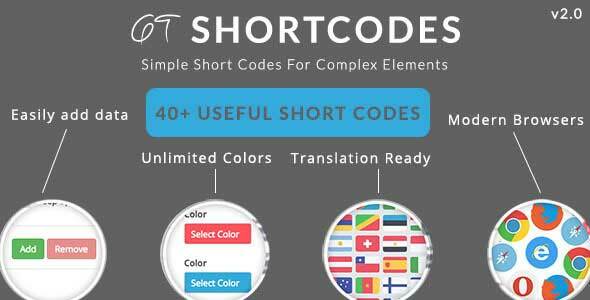 Now you might already be using a theme which comes with its collection of powerful shortcodes. But even still, we recommend using a plugin for the purpose. You see, as soon as you change the theme, the shortcodes that came with it will be of no use as well. But if you use a WordPress shortcode plugin, then you are free to change the theme as many times you want. Furthermore, it is also worth noting that different plugins will offer a different set of shortcodes which will help you do various tasks. This is why we recommend you to go through all the shortcode possibilities a plugin has to offer and pick the one that best suits your needs. Here we have put together a list of some of the best shortcode plugins in the market, which offers a varied set of shortcode possibilities. Whatever your budget, you will have something of relevance. Furthermore, once you have decided to use a particular shortcode plugin, then we advise you to stick with your decision. Similar to themes, if you uninstall the shortcode plugin, all its functionalities will disappear with it, which will mess up your website. WP Shortcode Pro is one of the most powerful Shortcode plugins for WordPress. It can help you create excellent looking posts and pages all packed with its live preview options with the help of shortcodes. You will notice results to be comparable to a page builder composer, if not better. With the potential to create full-fledged web pages, you can easily guess that the plugin is jam-packed with a lot of different shortcode options. Numerically, you will get access to over 80 different shortcode types which can help you add design elements or functional modules. Besides this, you get plenty of other functionalities as well. First and foremost, there is the option to create your shortcodes and overwrite existing ones. Everything is extremely well optimized to ensure that your fast loading speeds. Furthermore, all the shortcodes are coded to be responsive from the get-go, so they will scale perfectly regardless of what website it is viewed from. As you can collect from the name, here is a plugin from Themify that offers a collection of free shortcodes for you to use on your WordPress website. Being a free plugin, you won’t get access to too many advanced shortcodes, but it is also not lacking by any means. The plugin packs in a decent collection of around 16 shortcodes. This includes stuff like buttons, columns, horizontal lines, map, video player, post sliders, author boxes, and so on. You will also get access to a shortcode generator and a text editor which you can use to create your custom shortcodes as well. Shortcode Ultimate plugin IS one of the most advanced and comprehensive collections of shortcodes you can find for free. 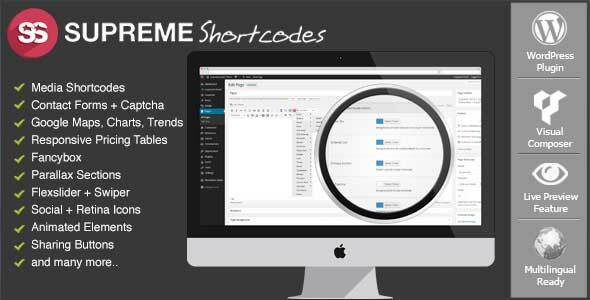 From enriching your site’s aesthetics to improving functionality, the shortcodes can help you in all possible departments. You will get access to over 50 shortcodes. You can quickly implement them on our post editor, your text widget, and even onto the template editor. Its diverse collection of shortcodes will help you to populate your site with responsive tabs, buttons, boxes, and even carousels on your website. It also has a robust API with its custom CSS editor. This is a shortcode plugin from the people over at Templatic. You will get access to over 16 shortcodes for design purposes which can help to make your content look great. Just installing and keep it hanging in your website for safe measures. It is very lightweight so that it won’t slow your website. Furthermore, it is completely free to use. Now coming to the different types of shortcodes you get with the plugin. Mostly all of them are design based shortcodes. For example, you get options for four different button sizes available in 7 different color options. Then there are labels, content boxes, message boxes, tabs, accordions, progress bars, and much. Essentially, you get access to all the essential design elements to help make your website not look bland. 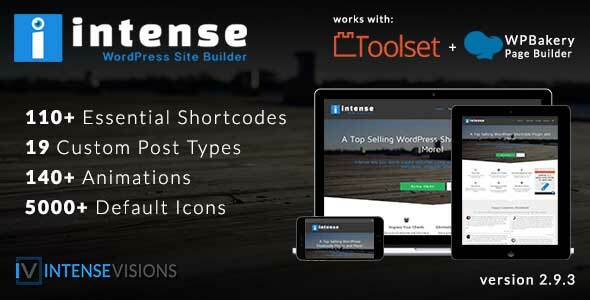 Intense is an extremely powerful and rich shortcode plugin for WordPress and carries over a hundred and ten shortcodes for your use. 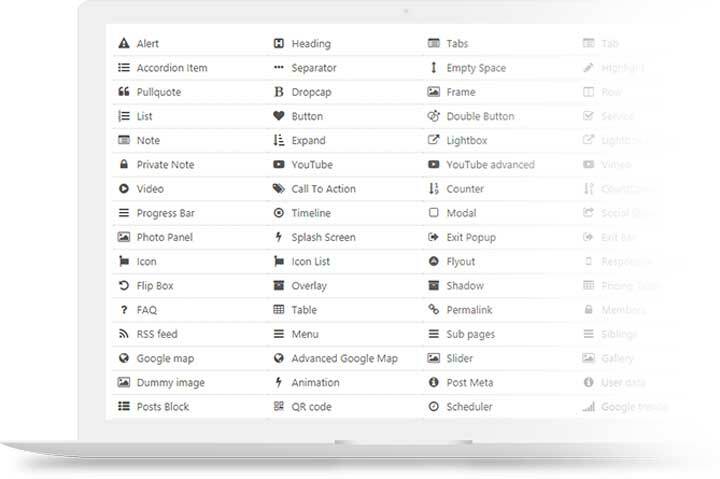 Besides this, the plugin will also give you access to over 19 custom post types, over a hundred and forty animations, and around five thousand icons. This shortcode WordPress plugin is built on top of the popular Bootstrap framework, so you can rest assured that all the elements are fully responsive and mobile friendly. They are also compatible with Visual Composer – the popular drag and drop page builder plugin. If you are new to WordPress and this shortcode business, then you should consider Fruitful Shortcodes. This WordPress shortcode plugin has by far, one of the most intuitive and easy to use UI out of the bunch of plugins we have on this list. Although you are new to this game, the plugin will help you to add elements like columns and rows, tab, buttons, and even progress bar to your website in a matter of clicks. You get access to around 15 shortcodes all of which are responsive and boasts a modern design. Also, there is a live preview functionality which lets you visualize how the shortcodes will integrate into your content. Vision is another one of the popular shortcode plugins that come with an enormous stash of useful shortcodes for your website. You will get access to over a hundred shortcodes, most of which functions to improve the overall aesthetics and presentation of your site. This WordPress shortcode plugin get directly added to your WordPress Content Editor from where you can add and implement them. Other than this, the plugin also offers around 28 color variations for all the elements as well as plenty of design variations as well. Supreme Shortcode brings home a whole barrage of useful feature and aesthetic elements which will help your site to look the best it possibly can. You practically get a laundry list of functionalities with this plugin, starting from simple media shortcodes and social sharing buttons, all the way up to Parallax Sections, and animation elements. Furthermore, the WP shortcode plugin has excellent synergy with Visual Composer and using the two together can help you improve your site customization potential. With ease, you will be able to add over a hundred extra functionalities to your website by just dragging and dropping them wherever you see fits. Next up on the list, we have WP Shortcode. This WordPress shortcode plugin is filled with shortcodes which can help you enrich your site’s visual appeal. You will get plenty of shortcodes that will help you to insert nicely designed buttons and column layouts with a simple click. Furthermore, all these shortcodes are minimally styled which should cause no problem while blending in with your overall site design. Now, in total, you will get your hands on around 25 different shortcodes, each of which specializes in their own thing. Some can help you to add highlights, while some of the other ones can help you to insert boxes, toggles, tabs, and even pricing tables. WordPress Shortcode is yet another free shortcode WordPress plugin which is also very popular inside the WordPress community. You will get access to a collection of over 26 shortcodes and many more elements. Most of the shortcodes are primarily focused on improving your site’s functionality; however, there is also a SlickPanel skin which can help enhance the visual appeal of the shortcodes as well. This shortcode plugin for WordPress will give you access to cool, useful functionalities for UI creation, layout management, lists, buttons, message boxes, and so much more. There is also a handy feature called smart links which will allow you to link contents to your site with the use of IDs or names, instead of URLs. As you might have guessed from the name, Simple Weather is a shortcode plugin for WordPress that helps you display the weather on your website. Besides short codes, the plugin also delivers a weather widget as well. The plugin is exceptionally customizable which enables you to have full control as to how the weather is displayed on your site. There are also plenty of filtering options as to how much options the plugin will display. For example, you can specify an update interval, enable 7-day forecast, show day and night temperature and so on. There is also full on localization and multi-language support. And finally, we come to GT Shortcode as the last entry on our list of shortcode WordPress plugins. It is a simple and easy to use plugin which is based on the Bootstrap framework. The plugin grants you access to over 40 useful shortcodes all of which boasts a clean, flat design language. If you run a website boasting the minimal design style, then the plugin will add aesthetic value. Apart from the shortcodes made available to you out of the box, this shortcode WordPress plugin also comes with a shortcode generator as well. It also gives you complete control over the shortcodes as well. There is a feature which allows you to activate or deactivate the use of CSS or JS files with certain shortcodes as necessary. 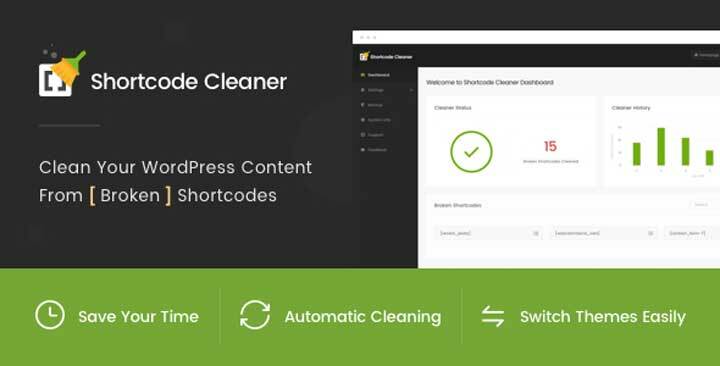 Shortcode Cleaner WordPress plugin isn’t there to help you generate shortcodes, but it functions to help you clean/delete broken shortcodes. The plugin functions automatically and behind the scenes to make sure your content is kept clean, and you don’t have to invest too much time into this troubling task. Now, this is a premium plugin, and as such offers some advanced functionalities. Besides erasing all the broken shortcodes to help reduce your website’s size, it also packs in a dedicated dashboard area complete with reports to give you the complete overview. The plugin can clean broken shortcodes from the backend, as well as the frontend, and both of these features can be turned on or off from the settings panel. It will also show you where all the broken shortcodes are on your WordPress website, so you can view and make necessary edits if you have to. Any Other WordPress Shortcode Plugin? So these were our picks for the best shortcode plugins for WordPress. We hope you found this read to be helpful. We have tried to include as many plugins with varying shortcode possibilities as we code. Do let us know if you found something useful and of relevance to your website. Also, if you use shortcode plugins yourself, and if it is something we left out of the list, then do mention them in the comments section below. We would love to know what plugins or other tools our readers are using.